your family through a wide range of legal needs. 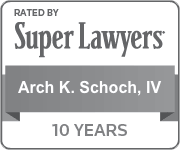 Schoch & Schoch is a multigenerational firm, dedicated to guiding you through the legal concerns that arise throughout your life. Our family has built a reputation for success in law and is a cornerstone of the community. Clients have come to trust us, and it is quite common for us to continue representing their children and grandchildren. As we handle your case, you can be assured that we care for each client and diligently prepare each case to meet your unique goals and wishes. We offer free initial consultations in most circumstances. Our lawyers handle personal injury cases ranging from car wrecks to wrongful death. Our criminal defense practice focuses on all types of misdemeanor and felony offenses, including DWI and traffic violations. No matter what type of legal issue you may be facing, you can count on us to do everything we can to resolve it in your best interest. Our clients appreciate the level of service they receive from everyone at our firm. You will deal directly with your attorney at each step in the process, so you can feel confident that everything possible is being done to secure a positive result in your case. We personally respond to all phone calls, and we have a policy of following up on each inquiry the same day. When you call during normal business hours, you will have a personal contact, not a menu of voicemail options. To arrange a complimentary initial consultation, please call us today at 336-884-4151. You may also contact us online. We are committed to quickly returning phone calls and emails with the customer service you deserve as you deal with the difficult strain of demanding legal situations. 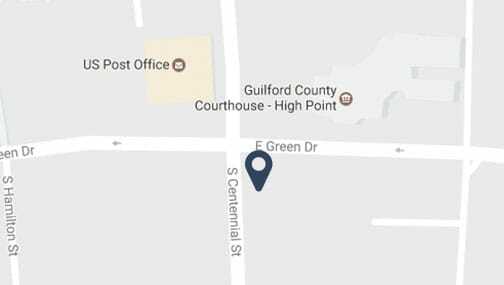 Our office in High Point is located directly across from the courthouse at the corner of East Green Drive and South Centennial Street.